CEO/Founder of BBU - BBU-"Where Ur Best U, Starts With Ur Better U"
by her single mother and her grandmother. She went to Long Beach schools the majority of her life, but for high school re-located to the San Fernando Valley in California. 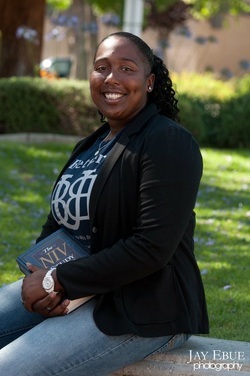 She then attended and graduated from CBU in Riverside with her degree in Business Administration, concentration in Management and Minor in Sociology, while playing basketball there all 4 years. Bryana has played basketball since she was 5 years old, always been athletic, a dancer, a writer and loved people. She is more of the reserved and conservative type of person and is that person who works hard behind the scenes type, but can also be outgoing and a leader when she needs to be. Bryana has always been put into leadership roles all through school and life. From student council president, to peer mediator, to captain of the basketball teams to a youth leader at church; she has always been put in roles to help others and lead by example. At a young age, Bry had a genuine love for working with kids. She loved doing community service and helping others. She was part of various ministries at church such as: the homeless ministry, youth ministry, hip hop dance choreographer, leader over a character development program and many more. Many said she was called to ministry, that she operated in many of the spiritual gifting’s, that she would do missions and be for the people to preach and teach the gospel. All though at that time she didn’t know what that meant or what that would look like; she began to get opportunities to operate in the calling and gain confidence in what God called her to do and what He had for her. From a teenager to now being a young adult, Bry has been on 3 mission trips in different countries, she has been a part of various motivational speaking engagements at different schools and events, ministered at many church services and events, been coaching for 7 years now and still going, worked in many different avenues in organizations working with children, teens and young adults. Has been privileged to be the director of the young adult ministry at her current home church, a missionary, a coach, an author, a writer, a poet, a dancer, song writer and has now launched the business ministry vision that God has given her, which you are all apart of now; B Better U! Thank you for being apart and sharing a piece of Coach Bry’s heart. She thanks you in advance for all the prayers, support and assistance. She hopes to see you all grow in the areas of your life where you seek change, as you go through the programs or attend events of BBU with her and the team. She prays that you all become the best you can be in all areas of your life by starting off with your better you. Welcome “Life Changers” to B Better U!